There are 33 Assisted Living Facilities in the Suwanee area, with 5 in Suwanee and 28 nearby. The average cost of assisted living in Suwanee is $3,433 per month. This is higher than the national median of $3,346. Cheaper nearby regions include Duluth with an average starting cost of $3,372. To help you with your search, browse the 204 reviews below for assisted living facilities in Suwanee. On average, consumers rate assisted living in Suwanee 4.3 out of 5 stars. Better rated regions include Duluth with an average rating of 4.7 out of 5 stars. Caring.com has helped thousands of families find high-quality senior care. To speak with one of our Family Advisors about assisted living options and costs in Suwanee, call (855) 863-8283. Considered one of the best places to live in Georgia, Suwanee has a history of winning awards like one of The Best Places to Live and Raise a Family. The city has over 600 acres of parkland for people of all ages to enjoy. In the city of Suwanee, assisted living facilities are both licensed and regulated by the Healthcare Facility Regulation, a division of the Georgia Department of Community Health. Suwanee is home to five assisted living facilities. There are a further 57 of these facilities located in reasonable proximity to the city. Suwanee’s assisted living facilities provide assistance with activities of daily living. The city of Suwanee is home to world-class medical facilities, including Gwinnett Urgent Care, in the event of medical emergencies or illness. The city of Suwanee is served by Gwinnett County Transit and MARTA. Area residents have convenient access to rail, bus, and paratransit services. Both services offer reduced fares for seniors aged 65 and over. The closest airport serving Suwanee is Hartsfield-Jackson Atlanta International Airport, which is 43 miles from the city center. Suwanee features various senior-friendly cultural attractions like the Suwanee Town Center Park. The city’s various assisted living facilities may offer supervised trips to events and attractions in nearby Atlanta like the Georgia Aquarium and Atlanta Botanical Garden. Unlike some major metropolitan areas in the state, Suwanee boasts a crime rate that is well below the national average and also below the state average. The annual number of crimes per 100,000 people in Suwanee is 678. The national average is 2,837. Suwanee has a 128 cost-of-living index. This is 28 points higher than the national average and 35 points above the state average for Georgia. While many people enjoy the sunny weather associated with Suwanee, its summers can be hot and humid with an average July temperature of 88 degrees. On the other hand, winters in Suwanee tend to be mild. The average January temperature is 31 degrees. Assisted Living costs in Suwanee start around $3,433 per month on average, while the nationwide average cost of assisted living is $4,000 per month, according to the latest figures from Genworth’s Cost of Care Survey. It’s important to note that assisted living rates in Suwanee and the surrounding suburbs can vary widely based on factors such as location, the level of care needed, apartment size and the types of amenities offered at each community. 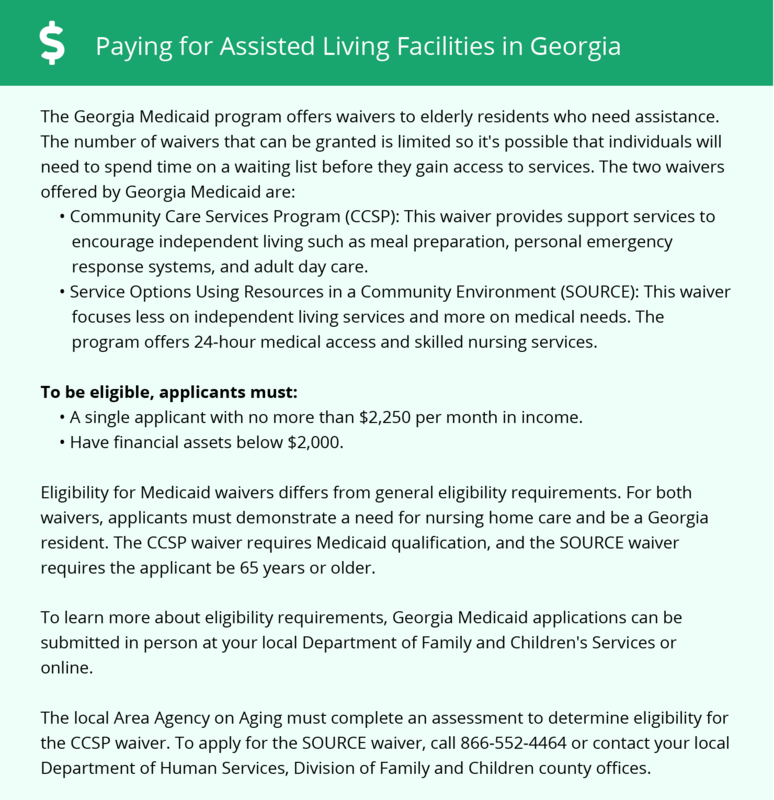 As in other areas of Georgia, Suwanee’s eligible seniors may receive assistance to pay for assisted living from Medicaid. Medicaid features two types of waivers: Service Options Using Resources in a Community Environment (SOURCE) and Community Care Services Program (CCSP). Suwanee and the surrounding area are home to numerous government agencies and non-profit organizations offering help for seniors searching for or currently residing in an assisted living community. These organizations can also provide assistance in a number of other eldercare services such as geriatric care management, elder law advice, estate planning, finding home care and health and wellness programs. To see a list of free assisted living resources in Suwanee, please visit our Assisted Living in Georgia page. Suwanee-area assisted living communities must adhere to the comprehensive set of state laws and regulations that all assisted living communities in Georgia are required to follow. Visit our Assisted Living in Georgia page for more information about these laws.